Euterpe Ionides (1861-1955) was the first child of Constantine Ionides and his wife Agathonike. Like several of Watts’s portraits of members of the Ionides family, this painting is in a frame designed by the artist. Short half-length, full-face portrait of a young lady with brown hair and eyes. She wears a blue dress with green tulle at the neck. The background is green with a brown atripe down either edge. Bequeathed by Constantine Alexander Ionides, 1900. However, it was stipulated in the will that this, along with 19 other family portraits, should stay in the family until the death of his wife - she died in 1920 when the paintings were received by the museum. Historical significance: George Frederick Watts was born on 23 September, 1817. He received no regular schooling on account of poor health, but later studied under the sculptor William Behnes and entered the R.A schools in 1835. In 1837 he achieved recognition for The Wounded Heron (Compton Watts Gal. ), exhibited at the R.A. Watts won a prize of £300 for his painting Caractacus in the 1843 Westminster Hall competition. He went to Florence until 1847, where he worked under the patronage of Lady Holland. On his return to England, Watts won a further prize of £500 in the Westminster Hall competition for his Alfred inciting the Saxons to prevent the landing of the Danes. With his reputation now firmly established, Watts was determined to devote himself to grand, universal themes, inspired by his study of Michelangelo, such as Faith; Hope; Charity; Love and Life; and Love and Death. 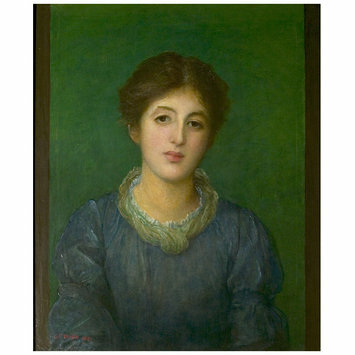 However he rose to front rank as a portrait painter and painted of his many eminent contemporaries including Thomas Carlyle, John Stuart Mill, William Gladstone and John Everett Millais. He was elected to the A.R.A and R.A in 1867. 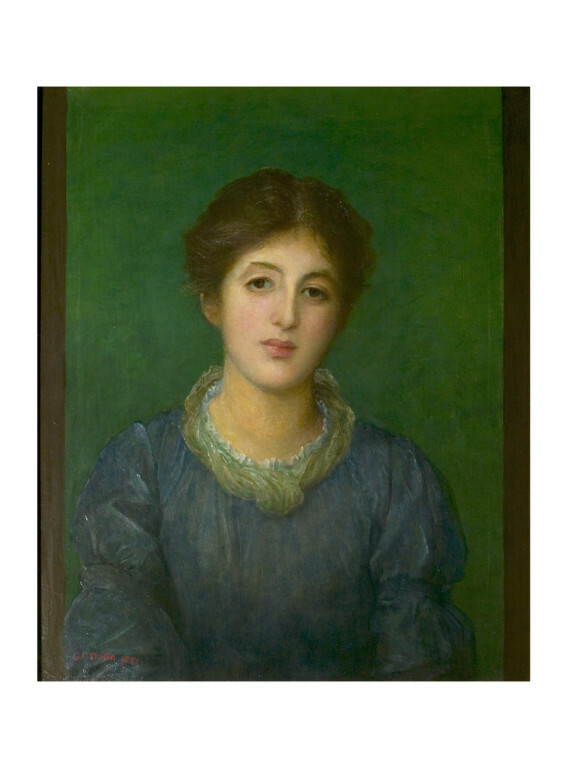 In 1864 he married 16-year-old Ellen Terry and painted a charming allegorical portrait of her, Choosing, but the couple separated the following year. A major late sculpture, Physical Energy (1904, London, Kensington Gardens) is surprisingly modernistic. Watts presented many of his works to art galleries and institutions. He died on 1 July, 1904. Euterpe Ionides, later Mrs W. F. Craies, (1861- 1955) was the eldest of eight children of Constantine Alexander Ionides, donor of the V&A's Ionides collection, and his wife Agathonike. 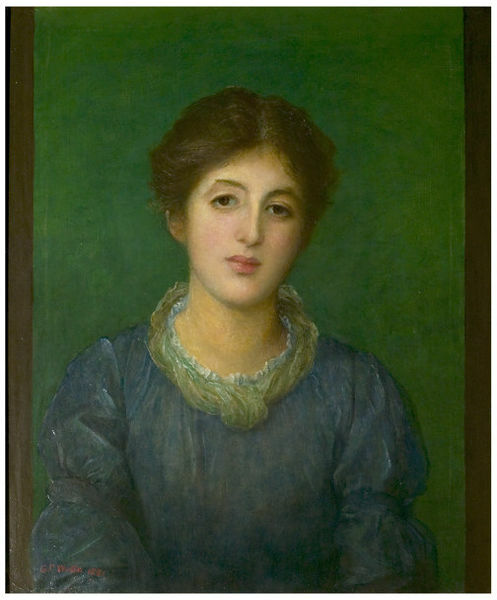 Here she is depicted in softened light, wearing a simple blue dress against a green background. During a lifelong friendship, G. F. Watts painted over fifty members of the Ionides family spread over five generations. From 1880-1881 Constantine Alexander commissioned Watts to paint a series of family portraits of himself (CAI 1141), his wife (CAI 1142) and his three daughters Euterpe, Helen or 'Lallie' (CAI 1144) and Zoe (CAI 1145). In 1880 Euterpe married a barrister, William Feilden Craies (1854-1911) of Brisbane. The couple had one son and two daughters. The frame was designed by G. F. Watts. The portrait entered the V&A collection in 1920 after the death of Agathonike Ionides.